Further training, with the objective of supporting people in companies to deal with current as well as future problems and provide them with new answers – that is the purpose of FestoDidactic. 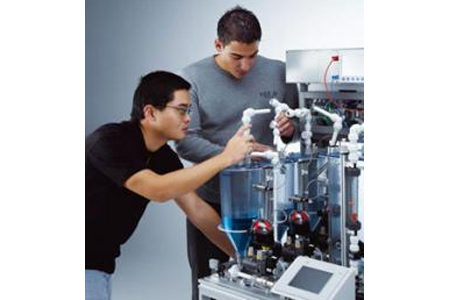 Festo is developing itself to become an important partner to the process industry. The close coordination with our parent company, Festo AG & Co. KG, ensures that state-of-the-art devices and systems are used in our learning systems. And our trainers have first-hand expert knowledge. Our orientation and methods set us apart. Our trainers and consultants are practicians. They are familiar with the tasks of their participants, even those that go beyond technical requirements. We have high standards. In our courses you will realise the difference between us and other providers: we provide new answers to old questions – answers that help you get that critical step ahead with your operational plans. Give us a call; we'll be happy to help. This course provides detailed insights into valve and fitting technology and shows how they are used in the process industry. Participants gain basic knowledge of the individual valve and fitting types and components. In addition, selecting materials and operating conditions/limitations are described in detail. The various types of actuators are also explained with regard to the individual fitting and valve types and all relevant standards are discussed. This course provides detailed and sound insights into process engineering. The various measuring types, as well as the different principles, such as pressure, flow rate, temperature and filling level control are treated in detail. Furthermore, control engineering is taught in-depth based on P, I and PID controllers, along with their advantages and disadvantages. Participants gain detailed and sound insights into process control technology based on P, I and PID controllers and their advantages and disadvantages. Practical exercises with the PA EduKit and the FluidLab®-PA software ensure that the knowledge acquired is transferred into practice.